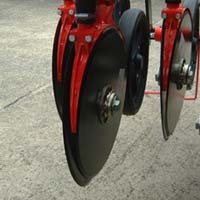 Double disc coulters with close coupled press wheels for optimum seed placement. Heavy duty, power harrow mounted markers leave an easily visible mark. 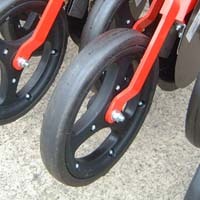 The angle of the large diameter marker disc's can be adjusted to ensure a clear mark is left in difficult seed beds. The offset metering unit makes application rate adjustment and calibration easy. Removing a thumb screw allows the venturi to drop away providing unimpeded access to collect the metered seed. Two rows of staggered following harrow tines leave a level seedbed. The maximum working depth of the tines can be adjusted as can tine pressure and angle. Pictured here on our 180hp Maxim Power Harrow this 2512 drill has been specified to include PE markers. 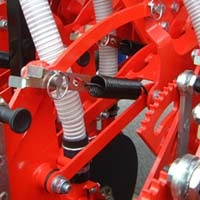 Close coupling of the drill to the harrow keeps weight close to the tractor for reduced lift requirement. Pictured here on our 250hp Magnum Power Harrow. 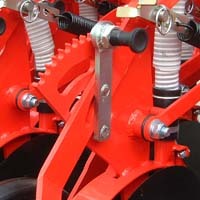 Close coupling of the drill to the harrow keeps weight close to the tractor for reduced lift requirement. Following years of experience mounting our drills on to various power harrows, we are able to supply fitting kits for most power harrows and some cultivators. Please contact us for more information.